SF Taxi Media: What Cab Companies In San Francisco Are Saying About "Taxi TVs". Part 2 of a 2 Part Segment. By John Han. 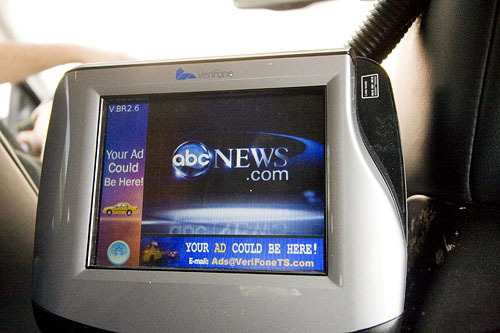 What Cab Companies In San Francisco Are Saying About "Taxi TVs". Part 2 of a 2 Part Segment. By John Han. De Soto Cab, Verifone Taxi TV. Photo by John Han. 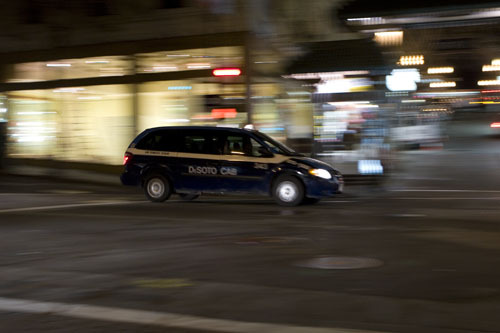 The following are excerpts from comments made by three representatives from three of San Francisco's well known cab companies, regarding Taxi Tvs, and 5% credit card fees. "I think the rear seat terminals are being put in by a profit making company that's seeking to make money off of ad revenues." 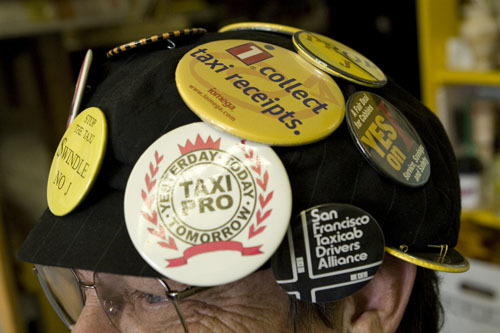 "I, first of all, don't think they're [SFMTA Taxi Services] being honest and straightforward about the financing. There are two different streams of revenue. One is the ad revenue and the other is the processing fees [from the drivers], and somebody's making money off both." "It's unfair in the first place that the drivers pay the 5% fee. Even if you could justify charging the driver in the first place, why should they pay so much more than any other merchant who is using a credit card service?" "When drivers are asked to pay this 5% charge, and companies are relieved of it, in essence what is happening is the medallion holders are the ones who benefit to the expense of the rest of the drivers. Because this gives the company leeway to pay the medallion holders more. Or if it's a company like Yellow that's cooperatively owned by medallion holders, it gives them the opportunity to distribute more profits to shareholders. Credit card fees are transfer of income from drivers to medallion holders, in large part." "It's completely bogus to say that they need that 5% to pay for installation costs, when those installation costs will soon be recaptured and more by the advertising revenue." "We ae not installing "TV's" or rear seat advertising screens in the rear of the taxis. Our rear seat pim unit will only be a credit card reader with a small screen for "touch screen" commands and signature capture. Luxor will be installing a large rectangular screen for advertising provided by CMT. CMT (Creative Mobile Technologies) has approximately 6500 units in New York City and a several hundred more in Chicago. We have decided not to go that way at this time. We started installing our new pim units this week. It will take a few months to get them in all our fleet. "I do support the notion that it will provide more tips for the drivers. If the fare is $10 or less, the choices for a tip will be $1, $2, $3, or Other. Over $10, the choices will be 20%, 25%, 30%, or Other. On transaction under $25, no signature required. Over $25, they sign the pim screen. There will be no need for the driver to turn in signed receipts. If they want a receipt, you just push the print button on your MDT as you have done in the past." "The bottom line is, until it's proven, people [drivers] don't have these units in the back, and so they are very skeptical of this. But there is no doubt in my mind that drivers make more money with the tip prompting back seat payment system by passengers." "With Verifone, you're able to link to any checking or savings account that you currently have or you want. Verifone will deposit your credit card charges directly to your account without any fees, without any charges. And absolutely you should not be paying any fees to access your own money. The 5% charge is supposed to take care of all transactions, customer service issues, administration, installation of equipment, and subsidize the equipment." "It may be about 2.5% above the transaction costs. So that other 2.5% of the 5% is really about providing the equipment for free, and all the other administrative and customer service issues." "De Soto no longer deals with any aspects of credit card transactions with the drivers anymore. So in other words, for me, I save money because that transaction cost that I had to administer when someone brought in receipts and I gave him cash for it, that's all gone now." "I don't get any financial compensation from Verifone for De Soto Cab. There's no rebate or anything like that. And there shouldn't be. 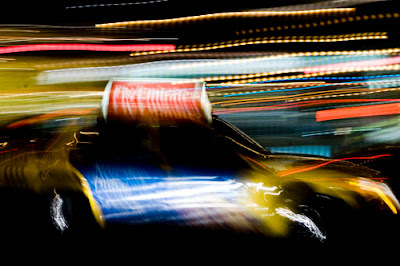 A cab company should not have a financial tie-in with their vendor." "You can't charge drivers 5% unless you can more than make up for it with a tip prompting back seat unit." "At De Soto, my drivers, really 99% of them love it now." Verifone Tip Prompter. 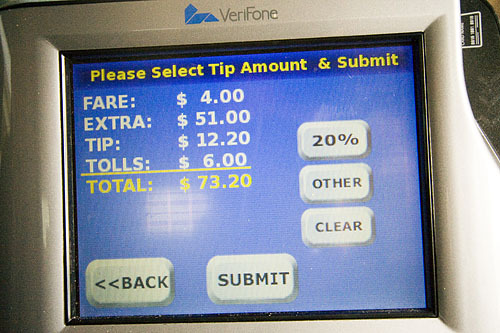 To demonstrate the tip prompter, the $4 fare with $51.00 in "Extra"
STILL TO COME - TIP PROMPTERS, PUBLIC RIDERSHIP, AND DRIVERS' RESPONSES.